I was thrilled to receive two awards this month. The first is “The Blog of Substance” award from my dear friend Rachna @ Rachna’s Scriptorium. This award means a lot to me as Rachna has chosen blogs that are unique and that she believes are Blogs with Substance. Rachna also asked me to pass this award onto other bloggers I deem worthy. I am also required to add a funny anecdote with the only requirement be that it is related to writing. So if these writers could click either on my award widget on the right hand side of this blog or on the link at the top of this page, they can receive their award. I only ask that they pass it onto at least 3 other Blogs worthy of this award and relate a writing related anecdote for us. Now for my funny anecdote about writing…Mmmhhh this was a difficult one to come up with. I am a writer. I am a reader. I love anything to do with words. I always have. My nickname, given to me by a pediatrician, when I was a child was bookworm. Everywhere I go, a book, a notebook and a pen/pencil go with me. My family has always joked that the worst punishment would be taking my books, paper and pens away. As a result of this I also have a stationery and notebook/journal addiction. I cannot pass a stationers without buying at least one new implement or new journal. Well about 11 years ago I went and visited my best friend in Greece. She had recently immigrated there and I went across to go and see her new home. Of course, one never needs an excuse to visit Greece. (Just going on record here stating that Greece is my favourite country on this planet.) Well, as usual I took some books along to read as well as a journal and a pencil-case. One of the books I took with me was my favourite: Wuthering Heights by Emily Bronte. I was excited to be seeing my best friend and to see Greece. The only thing I did not realise was how Greek Greece is. This meant that there was almost nothing printed in English. At first this was not a problem. I had my books I had brought with me and writing implements. Eventually this did become an issue. I wanted to know what was going on but I could not read any newspapers or magazines. So in short thrift, I asked my best friend to teach me the greek alphabet so that I could read. She looked at me and thought this not at all unusual coming from me. So she taught me the greek alphabet and then taught me to read and write in Greek. Always having an aptitude for languages, I was a quick study. Within a couple of weeks I was reading menus. newspapers and magazines – in Greek! I realised then how important language truly is. A lack of language creates boundaries and a love and learning of languages increases our imagination and our comprehension. Yes Language and words are lovely and necessary tools. We are humans. We are creatures of communication. This separates us from the other creatures on this planet. I am thankful first to my parents for teaching me to read and to give me my love for all words. I am also thankful to my best friend for teaching me greek so that I could communicate with others. So that is my anecdote. Now onto my other award for the month. I recently received an award from Kiwi Writers for being their November Blogger of the Month. I am humbled and honored to receive this award. So thank you to Kiwi Writers for this nomination, this award and this honor. I do cherish it. Thank you to Rachna and to Kiwi Writers for these November Awards. I will cherish them. Congrats with both the awards. I’d like to thank you this way for connecting with me at SheWrites and then to introduce me to the NaNoWarriors group. In my mind you are the number one starter of NaNoWriMo, if only because of living in NZ and you beating all of us time wise by how many hours. You’ll always be ahead of many of us. That you manage to put in more words than anybody else I know is another matter all together, or is it? Now for the Greek language. You are awesome! To learn a Roman language is one, to have to master a foreign alphabet is a horse of a totally different color (American cliches remain fresh to an ESL (English as a Second Language) reader and speaker)). If I had an award to give out it would be yours right now, and you may have given me the incentive to create one. But not in November, I’ve got to get back to timed writing pretty soon! Have a great rest of the month and enjoy your successes and awards! And NaNoWriMo too is just phenomenal in bringing together so many different people all with the same dream and passion: writing. Your comments really made me smile! Thank you my NaNo US PST friend! 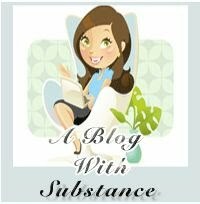 Thank you so much for awarding the Scribe Sisters the Blog Of Substance award! I feel so honored! It is my pleasure Heather! You completely deserve both awards. I’m really enjoying following your blog and it’s always full of interesting content.